Thermal NOx is formed when nitrogen and oxygen in the combustion air combine with one another at the high temperatures in a flame. Thermal NOx makes up the majority of NOx formed during the combustion of gases and light oils. 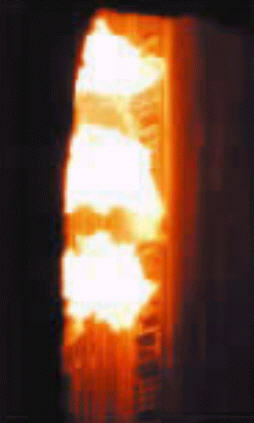 The rate of NOx formation generally increases significantly above 2,800°F flame temperature. Fuel NOx is formed by the reaction of nitrogen bound in the fuel with oxygen in the combustion air. It is rarely a problem with gaseous fuels. But in oils containing significant amounts of fuel-bound nitrogen, fuel NOx can account for up to 50% of the total NOx emissions. A third and generally less important source of NOx formation is Prompt NOx which forms from the rapid reaction of atmospheric nitrogen with hydrocarbon radicals. Prompt NOx is generally minor compared to the overall quantity of NOx generated from combustion. However, as NOx emissions are reduced to extremely low limits, the contribution of this source becomes more important. NOx emissions from boilers are influenced by many factors. The most significant factors are flame temperature the amount of nitrogen in the fuel, excess air level and combustion air temperature. Also, a longer residence time at high temperatures results in higher NOx. Most NOx control technologies for industrial boilers with inputs less than 100 MMBtu/hr, reduce thermal NOx and have little affect on fuel NOx. Fuel NOx is most economically reduced in commercial and industrial boilers by switching to cleaner fuels (fuels containing less fuel-bound nitrogen), if available. “Boiler Emissions Reference Guide”; Cleaver Brooks (available on their website).